Ready To Become A Prospect List Building Expert? 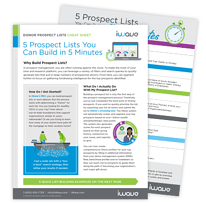 Are you ready to become a prospect list building expert? We pulled together the best tips for building your nonprofit's new list of top prospective donors. With this cheat sheet, you're going to learn some seriously easy strategies to make exceeding campaign goals a reality.